In this post I will share my recent purchase (aka–my secret weapon) of how I am cutting calories even more, and getting even more healthier with my diet. In my last post, I posted a picture of my lunch (I’ll re-post the pic in this post). I talked about how it was only about 260 calories. So I tried to brainstorm ways I can reduce this 200-300 calories I would be eating every day in just olive oil/cooking oil alone. This was hard because at first I thought I could boil all my meat. This works for chicken okay, but not so much for fish. Then I thought about baking it, but you really need to add oil to the pan or else it will stick. So I kept trying to find a way to cook my foods (meat especially) in a way so I could reduce calories even more. I also thought about grilling it, but the problem here is that you have to buy lots of charcoal (or propane), and it takes a long time to clean a grill, get it ready, etc. Not to mention the fact that charcoal will put about as many carcinogens (cancer causing chemicals) in your food as about 1 entire pack of cigarettes. So I am not a huge grilling out fat. Then, I stumbled upon an idea: Steam it! Aha! I could steam all my foods. I could steam chicken, I could steam veggies, I could steam boil an egg. As I researched this idea, I became more intrigued. It turns out that steaming food retains a whole lot more of the nutrients than boiling it. 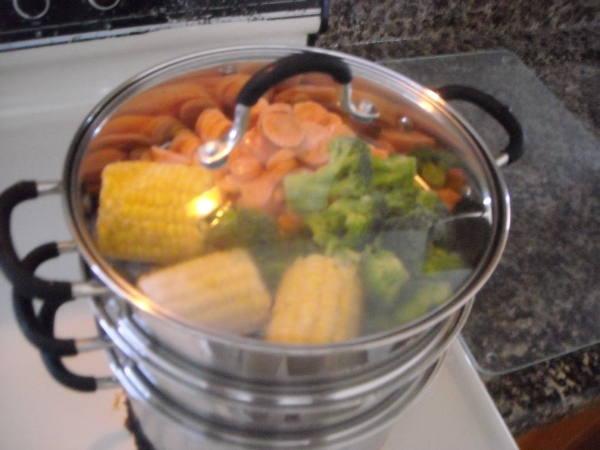 Plus it is a whole lot easier to steam foods, because if you buy a good steamer, you can cook all the foods at one time within the same steamer. So I began researching steamers. The pros of a plastic steamer is that they often have 2-4 “tiers” that you can cook, and they are a bit cheaper at around $20-40. The cons are that they don’t last very long. Some of the reviews I read said that the lid had already cracked within a few months. Another “con” is that some people speculate that cooking in plastic contains may not be very safe (ie, cause cancer or something). 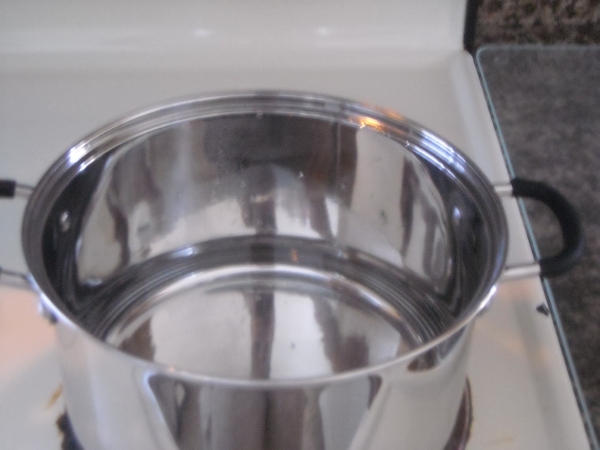 Another con is that even thought he steam pots are removeable and washable, the base typically isn’t. I was concerned about food leaking down and not being able to clean it. So I passed on the plastic ones, even though I came close to buying it for the “cheap” factor. You can browse some plastic steamers on Amazon (most have free shipping if you spend at least $25). There were also a couple of bamboo/wooden steamers I found in my research. While some had good reviews, I decided it wasn’t what I wanted. For one thing it didn’t seem like it would hold up over time. Also, wood can harbor bacteria and be hard to clean, and I didn’t want to mess with that. So I passed on it. Finally I learned about stainless steel steamer options. I really like stainless steel because it is very durable, and pretty easy to keep clean. If you take care of stainless steel, it will probably outlast you. The only problem was that most of the stainless steel steamers I could find only had 1 steaming tier. In other words, you would have to steam everything on 1 tier together. Also, many were small, and didn’t look like they would hold much food. This is when I found my solution: The Joyce Chen 3 tier Steamer. So after researching and shopping steamers, my wife and I finally decided that the stainless steel 3 tier steamer by Joyce Chen was the one we wanted. So we bought it. When we finally got it and used it…we were thrilled! Wow, this thing is AMAZING. Durable, and will probably last my entire life. Can steam 2 levels of food. Also comes with a lid that fits each tier (you can use only the pot, 1 tier, or 2 tiers on the pot and the lid fits all of them). Nice size–My wife and I cook more than enough food for both of us with plenty of room to spare. 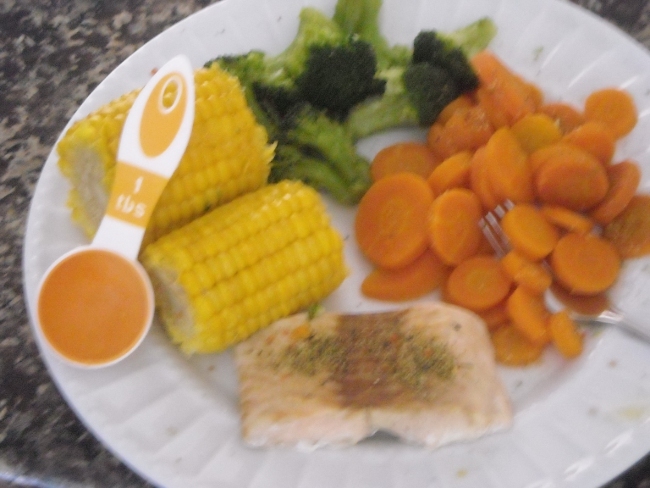 Saves time–I steamed my salmon meal in exactly 13 minutes. It was all at one time too. Sturdy botttom–it has a flat bottom (great for flat top stoves) and has encapsulated aluminum inside the stainless steel for more even cooking. Eliminates the need to add olive oil or cooking oils. No non-stick (possible cancer causing) teflon cookware needed. You an use the stainless steel tiers as strainers for spaghetti and other meals if needed. Okay, so after the water is added, I add the first steamer tier. This is where you put the food that requires the most steam/heat. So I put salmon, chicken, or whatever meat I cook on the bottom tier. Here is a picture of my salmon and my wife’s pollock fish. As you can see, I could easily put many more pieces of fish/chicken, or whatever. So there you have it. Put some water in the bottom pot, turn on the burner, add some meat in the first tier (recommended dethawed for quicker cooking), and add some frozen or fresh veggies to the top tier. Put on the lid, set the timer, and walk away. 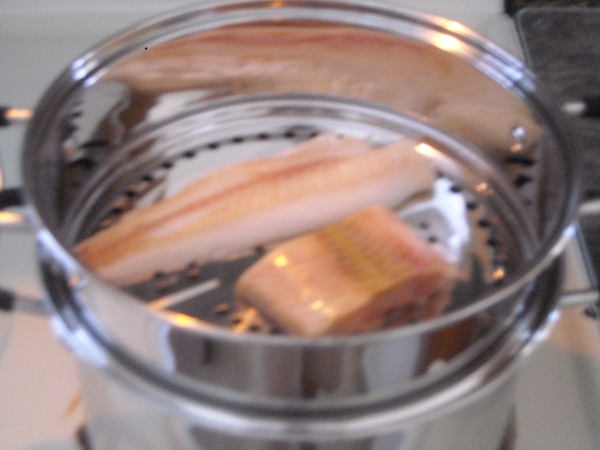 It takes me about 10-14 minutes to steam fish (depending on the size and how thawed it is). This is so easy. The food pops right off of this steamer–no sticking because it isn’t being burned on by the burner. It comes off nice and steamed. Add a little seasoning, lemon juice, and yum… an easy 260 calorie meal. Doesn’t get much healthier, low calorie, or easier than that does it? 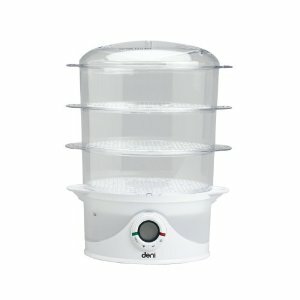 Check out Amazon.com for some great stainless steel steamer (again, I recommend the Joyce Chen, or at least 2 tier equivalents). Again, 2 tbsp of olive oil is about the same calories as this whole plate of food. I am not good at cooking, and even I can use this thing. My wife and I love it. We have been telling everyone in our family about it. When you are done, it is really easy to clean. Pop it into the dishwasher and clean the whole thing, or wash by hand soon after use for really easy cleaning. The salmon and fish just flakes apart and is so juicy and tender. So there you have it. This steamer is awesome. It has helped me reduce my calorie intake (by reducing cooking oils), it minimizes dirty pots because you can cook an entire meal in it, and it minimizes cooking time. An entire meal start to finish takes 10-20 minutes. How easy is that? So if you are looking for ways to reduce using cooking oils, or ways to cook food in a different, way, check out steamers! That’s all the posts I think I can get out today. Whew. Tomorrow I will continue this series with some low calorie snack ideas. Then, I am going to talk about the 1 other nutrition thing I was doing wrong (this is important)–I suspect many of you may be doing this wrong too. I may also share some recipes soon. I want to spend a few more posts talking specifically about nutrition and some tips I have learned, and then I am going to talk A LOT about exercise. I may even post some before and after pictures pretty soon so you can see how my visceral fat is starting to drop down.